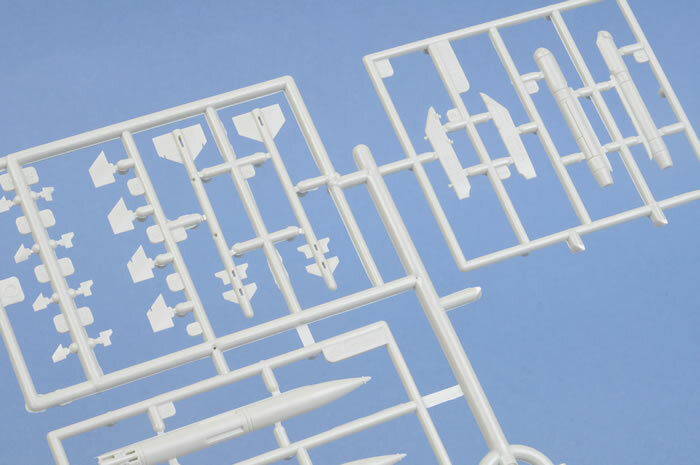 Contents and Media: Approximately 170 parts in grey and 12 parts in clear; markings for four aircraft. 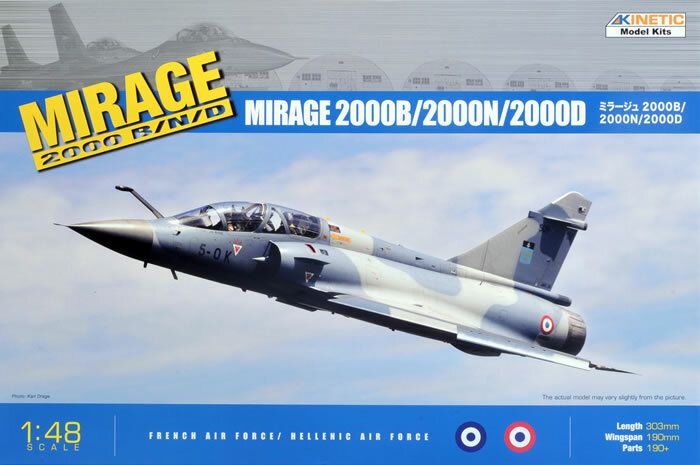 Advantages: The best Mirage 2000 available to date; well detailed; excellent surface features; positionable inner and outer elevons; crisp decals printed in register; parts to build the Mirage 2000B, 2000D, or 2000N; engine nozzle is supplied in the closed or open position. I have been waiting eagerly for this release from Kinetic after I built the Eduard re-boxing of the Mirage 2000C and 2000B/D/N two years ago. The fuselage compares well with drawings with just the nose at the radome intersection being marginally too small in profile (0.2mm). 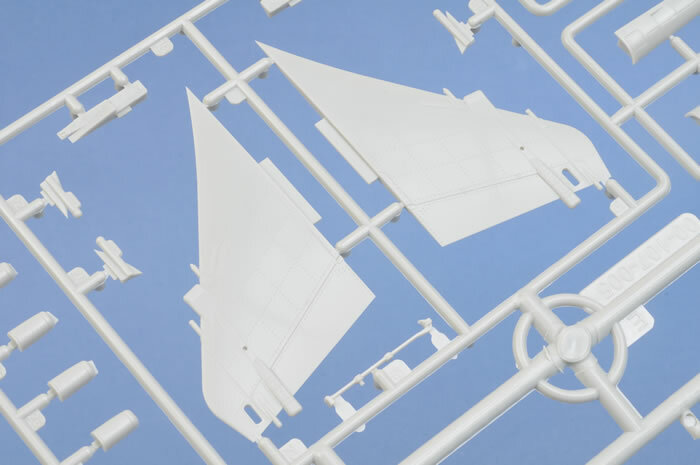 The wings are good and when removed from the sprue I noticed they may not have enough anhedral, but this cannot be determined until the kit is assembled and glued properly. Anhedral should be easy to fix with some gentle persuasion and I will address this in the build review. 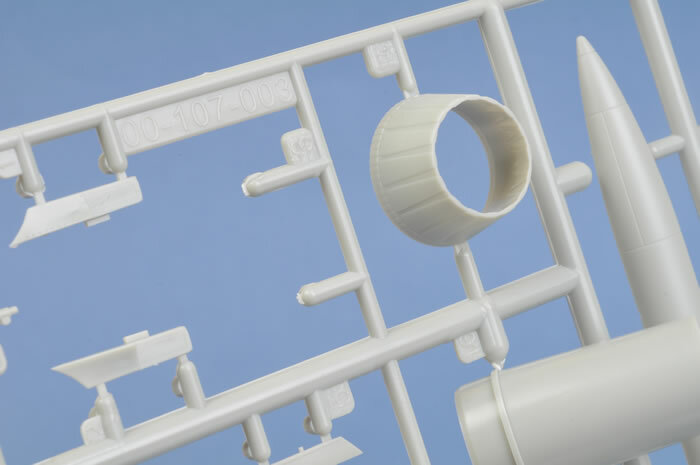 The panel line and surface detail is crisp and well defined and this is an area that Kinetic continue to improve in although there are some critics who continue to compare this to other manufactures such as Hasegawa and Tamiya who have been in the moulding business for over 40 years. The cockpit has sufficient detail on the cockpit tub and instrument panels. The panel detail matches that of the Mirage 2000-5 with CRT displays, I am not sure that they represent the 2000B/D/N unless the cockpits were upgraded since initial production. Eduard produce an etched metal panel set for the Heller kit and I am sure these will easily fit. The ejection seats represent the Martin Baker Mk10 seat quite well but do not have any harness detail. The front seat is depicted with the prominent canopy breaker horns fitted on each side of the headrest which are not present on the rear seat. 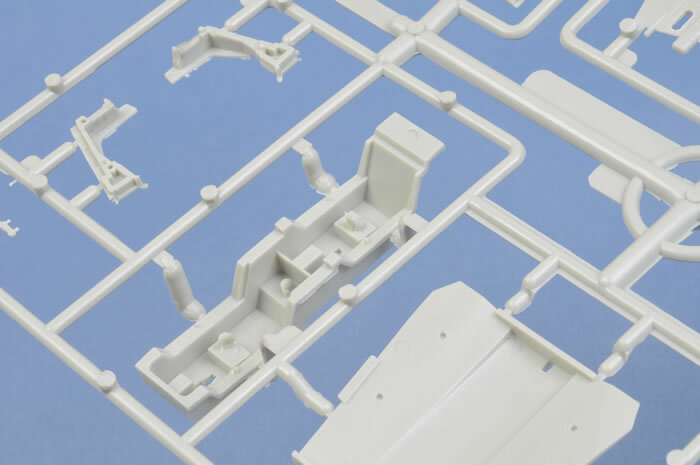 As with their F-16 kits, Kinetic may release seat harness and instrument panel detail as an aftermarket item, but for this we will have to wait and see. 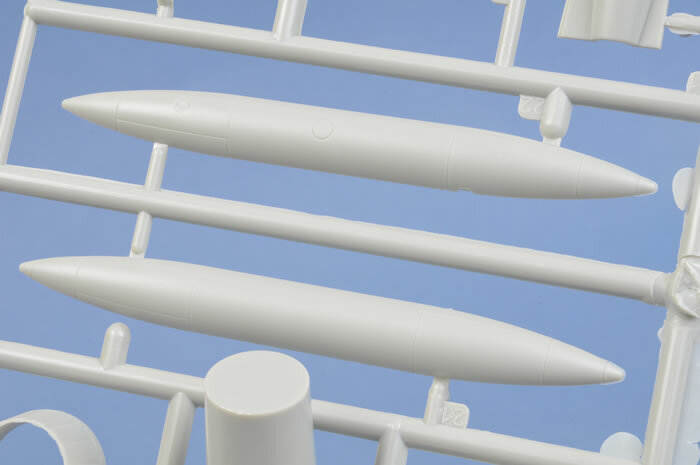 The two different spine panels are supplied for the B/N and the D version and three vertical fins are supplied to make the appropriate versions. The undercarriage wells are a bit sparse but unlike the Mirage III/V family the main doors are rarely open on the ground so therefore not much of the wheel wells will be visible anyway. The instructions would have the doors modelled open but so far in my research I have only found three photographs out of about forty of static aircraft with the doors in the open position. The nose wheel well has a prominent ejector pin mark that needs to be eliminated with filler. The undercarriage legs are nicely detailed but also need some minor work to remove some injector pin marks as well. Once again Kinetic have provided separate wheel hubs that sandwich between the two tyre halves allowing you to paint the parts without masking and only requiring the tyre seam to be painted post assembly. Kinetic must be congratulated on proving positionable inner and outer elevons. These are almost always in the drooped position when there is no hydraulic power on the aircraft. 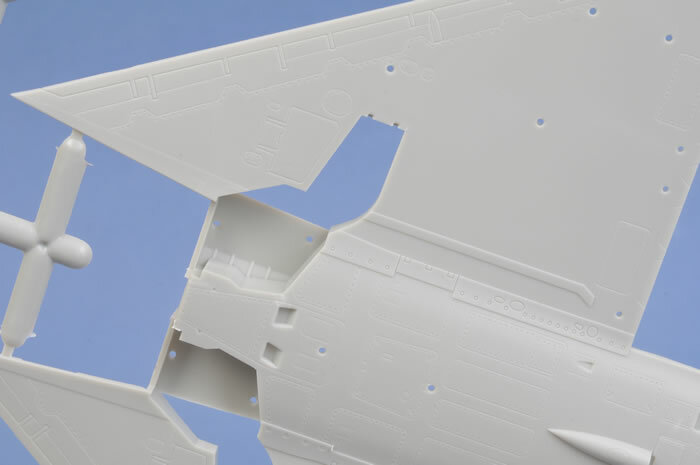 This is something totally overlooked by most manufactures of previous Mirage kits, the elevons on all Mirages are only in the streamlined position under aircraft hydraulic power. Separate nose radomes are supplied for the B/N and D version the later having a sharp point rather than the pitot probe of the B/N. The engine nozzle is supplied in the closed or open position. Unfortunately the two piece closed nozzle has better interior petal detail than the open nozzle. Once again with the SNECMA series engine which powers almost all Mirage versions the exhaust nozzle is fully open whin the engine is unpowered. The nozzle only closes as military power is increased prior to afterburner operation and the nozzle operates under engine operated hydraulic power. Kinetic missed mentioning the engine nozzle fitment in the instruction sheet, it just appears in step 6, I have notified them so the can correct the instruction sheet in further releases. The canopy is supplied to be fitted either open or closed. 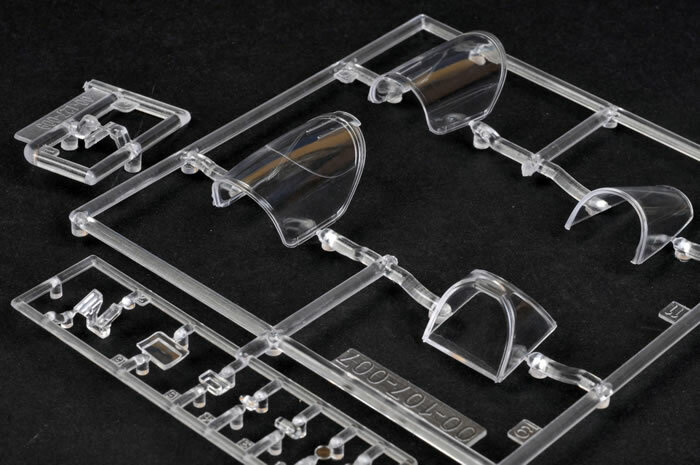 The transparency is crystal clear and contains the prominent hinge reinforcing bars. The front canopy has the canopy shatter panel nicely moulded into the canopy. 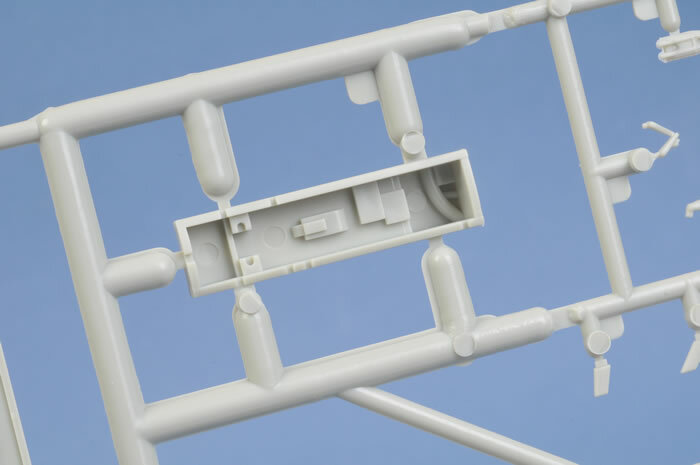 Over the past few weeks there have been many forum postings highlighting supposed inaccuracies in the canopies for this kit. 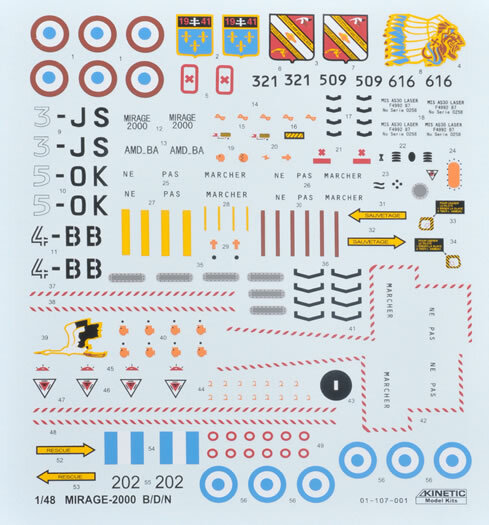 This prompted me to gather all the reference material that I had available to me on the Mirage 2000. I studied the many pictures in World Airpower Journal Vol 10 and the Airdoc French Deltas book on the Mirage 2000, and the canopy bow shape at the front of the forward canopy does appear to have a very subtle blown shape as claimed on many of the forums. 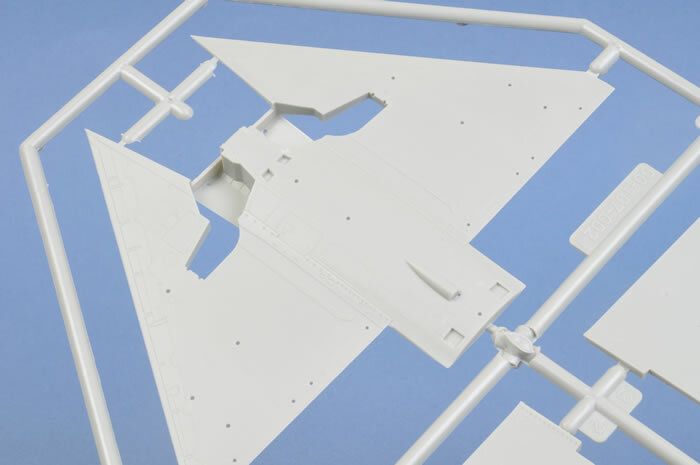 The shape of the canopy looks to be a little different to the Mirage III that I worked on for many years. The Mirage III did not have blown canopy being proper U shape rather than a subtle omega shape that is required for the Mirage 2000 but certainly not as prominent as the omega shape that we started to see on US built aircraft of the same era. 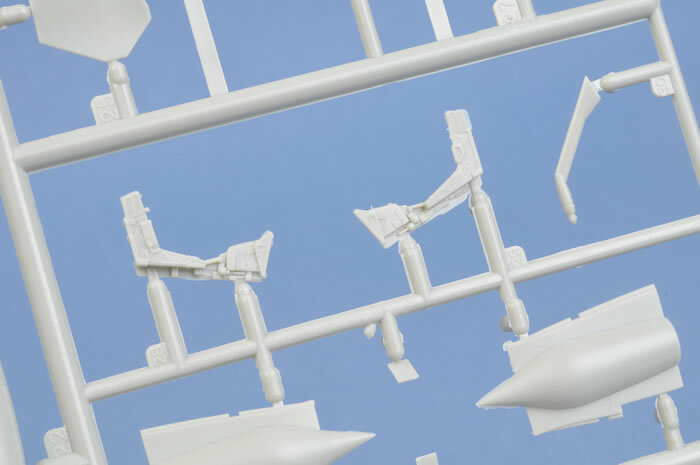 The Mirage 2000 forward canopy has a very minor omega shape that is accentuated more by the lower canopy frame sharply tapering outwards from the intersection of the transparency and the frame. 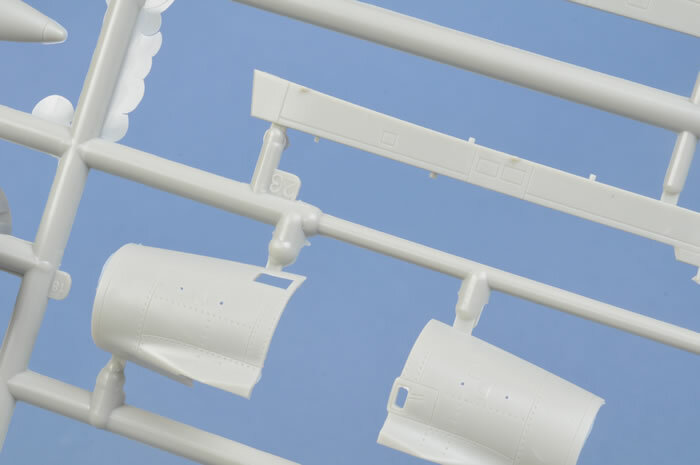 The waisting at this point looks to be about one to two inches and one could question wether the extra cost of capturing this in the mould and the inconvenience of a seam line down the middle of the canopies as a result is really worth the extra cost that would be passed on in the kit price. 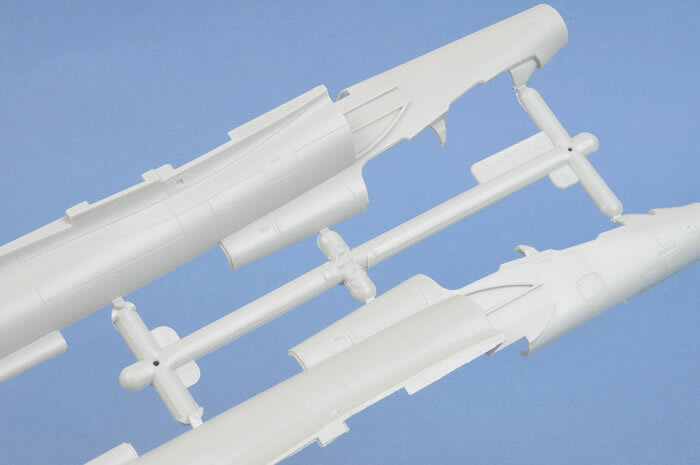 The canopies were compared to the Eduard/Heller offering, which also do not have the subtle omega shape as do many kits of other aircraft types produced today. I finally checked against Richard Caruana’s scale drawings and profiles in Scale Aviation Modeller. 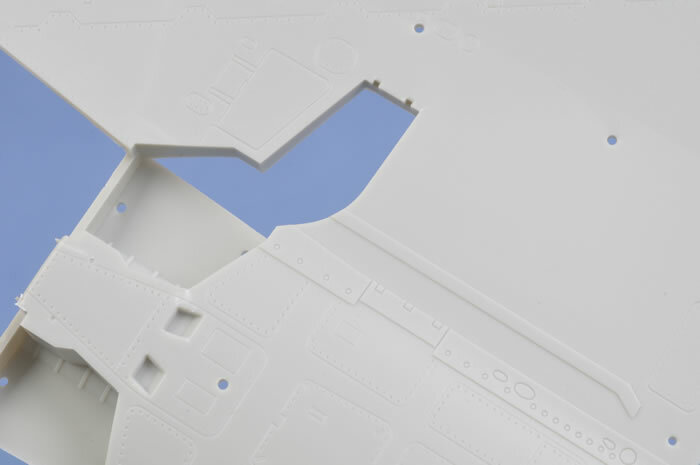 I placed all the transparencies onto the scale drawings and was surprised when the outline of the canopy width fell almost perfectly onto the drawing’s lines approximately a lines width too wide (0.2mm). As I mentioned earlier the canopies are missing the subtle waisting effect. There will probably still be people who dispute this point, but at the end of the day it is the builder’s choice as to what is acceptable, but that being said the rest of the kit is quite accurate compared to the drawings and photographs as detailed below. 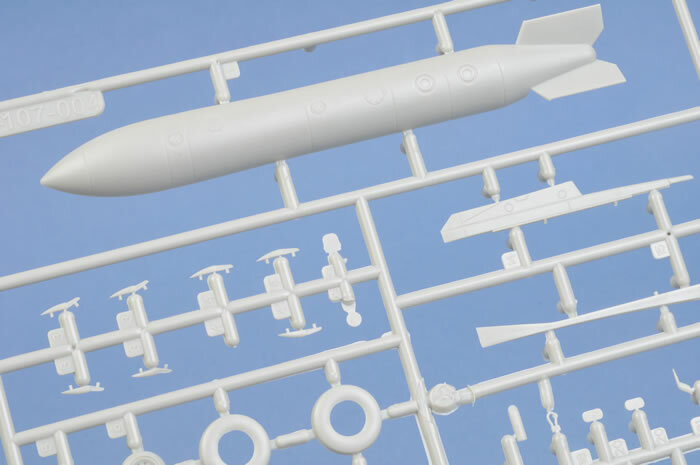 The Nuclear ASMP is not provided in this kit for the 2000N, Skunkworks models may release some modern French weapons in the future. At first I had some reservations around the 2000 litre wing fuel tanks as these have a prominent bulbous nose. I compared these to the Heller tanks as I did not have any drawings, the bulbous nose was the correct width and having viewed the built promo photographs of the built Kinetic kits I am now convinced these are close to being correct with maybe the taper back to the slimmer rear being just a bit subtle. Kinetic has not supplied the more streamlined non bulbous tanks that are commonly carried by the export customers and most of the data that I have show the bulbous tanks are always carried by the 2000N model but not so common on other models. 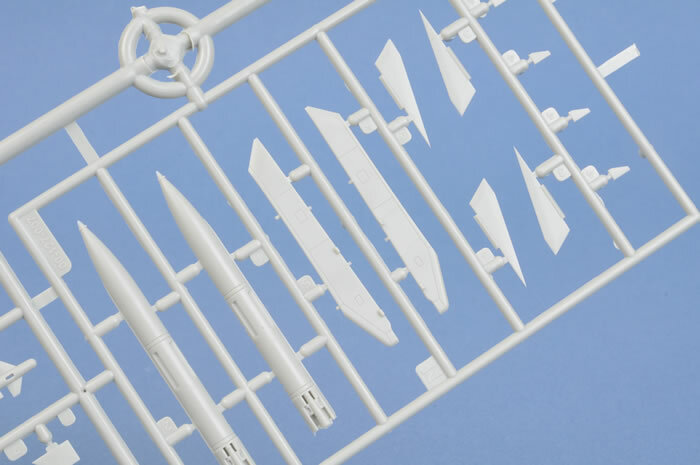 Decals are crisply printed and include a good level of airframe stencilling and weapons markings. 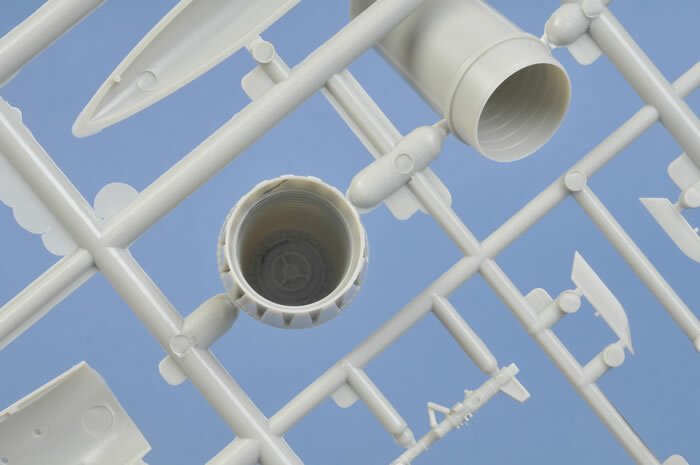 The painting instructions are based on Gunze paints. Mirage 2000BG, 202, Hellenic AF in two Grey Scheme. 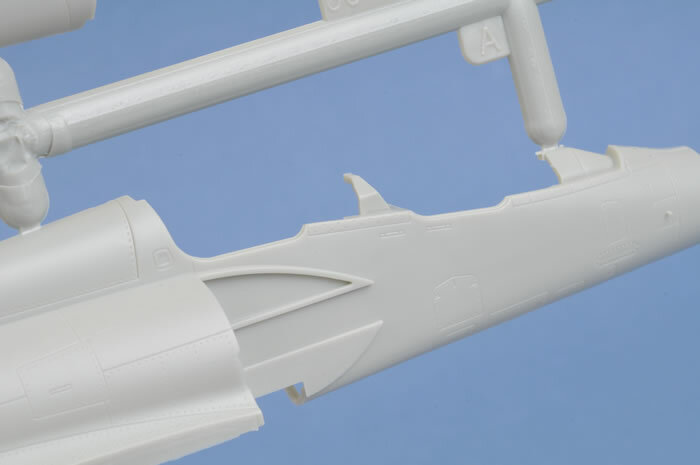 This is a very nice offering and certainly an improvement over all previously released Mirage 2000 kits. 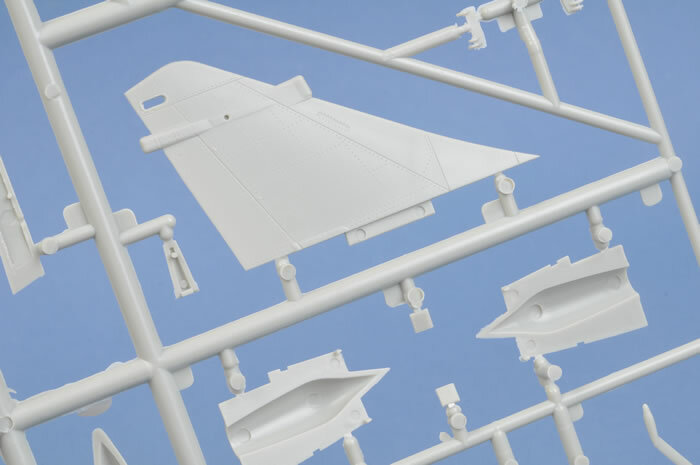 The non-bulged canopy will not appeal to the perfectionists but even when Hasegawa was the first manufacturer to release a bulged canopy in the 1/72 scale F-18 kit, everyone complained about the seam line up the middle of the canopy. For me the blown canopy is neither here nor there. The kit looks great and I am itching to build it after some of the woes of building both Eduard/Heller kits and I do hope Kinetic follow this with a 2000C kit, weapons set and etched details. 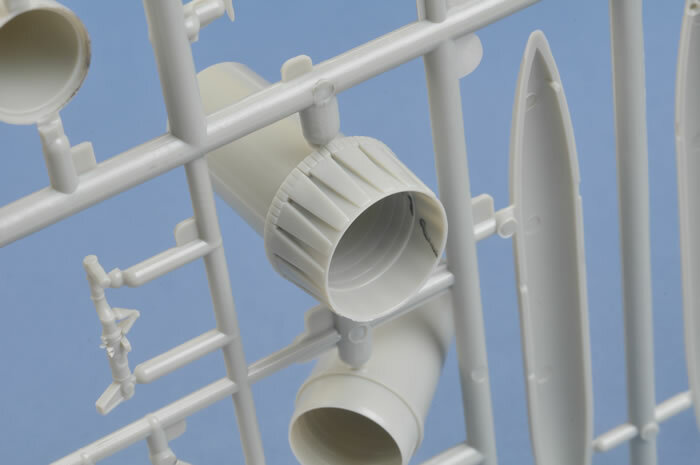 The simple thing is modellers of all levels of skill can easily build this kit and turn out a great result. At less than USD$30.00, the kit represents great value too. Excellent work from Kinetic and I hope they keep rolling out their great modern subjects.